Every once in a while, there’s an economics professor who manages to put together a research paper that appeals to gadget geeks and iPhone nerds. 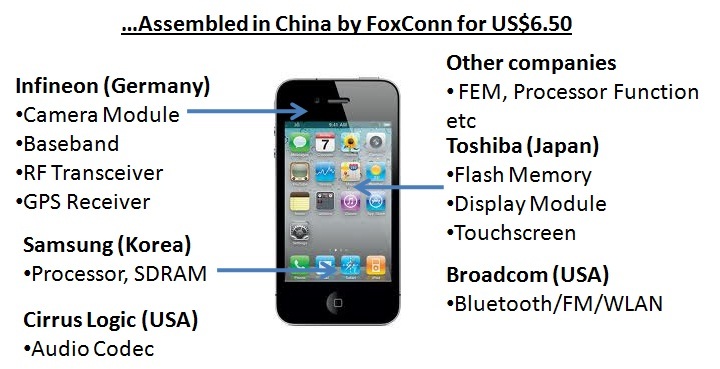 Recently, it was reported in Vox that a Professor Xing tried to do this by digging up a breakdown of the country of origin and the corresponding costs for the various components that go into an iPhone 3G. His thesis was that the Chinese labour costs for the iPhone assembly accounted for only $6.50 out of a grand total of $178.96 and hence a revaluation of the Chinese dollar will not really have a real impact on US competitiveness and the global demand for products simply assembled in China. 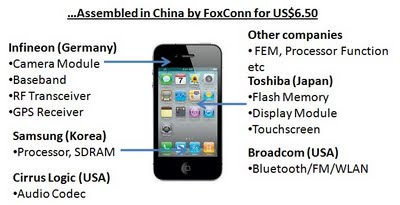 In fact, if the same iPhone was assembled in the US, given that labour costs are 10 times more than China, the manufacturing costs would have been $65, resulting in a grand total price of $237.46 or a 30% increase in price. 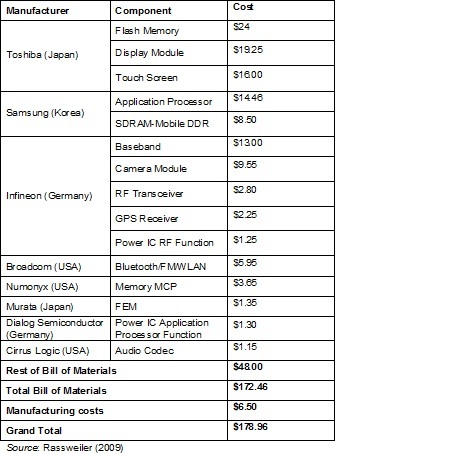 Now, looking at how laptop costs have come down, I suppose the costs of materials wouldn't have increased substantially for the iPhone 4(despite the higher specifications) and so this analysis probably still holds true. 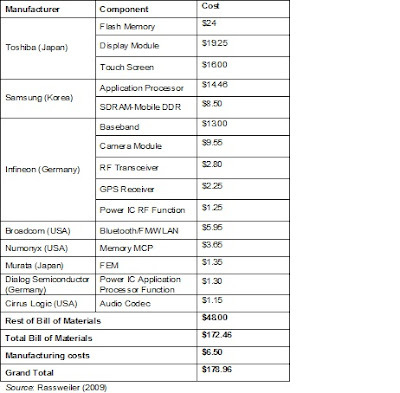 Given that the iPhone 4 is currently priced at $199 bundled with an AT&T plan, I would say that the iPhone pricing seems to be fairly competitive based on the estimated costs of materials which obviously haven’t taken into account software development and integration costs, as well as other administrative overheads. Which explains why Apple is still the world leader in the smartphone market - not just on account of its App Store.